Recently I talked about errors 1328 and 1603 which prevented me from installing an update. On several systems I ran into additional errors. Unfortunately at this time I haven’t been able to pin down if these are related to the R9 update or not – I suspect that it might be as I usually have all of my 2010 clients upgraded to the latest release. Interestingly, I’ve only seen this issue with Enterprise clients. Clicking “OK” here usually generates another error that will specify the particular DLL that has the problem – it isn’t important which one it is. Updating to the latest release. Reinstalling QuickBooks if the problem persists. In the case that I’m using as an example here, rebooting didn’t resolve the problem. In one client site this helped. This was a client who rarely reboots, always has the computer “sleep” instead. I like to reboot my systems fairly often, to clear out problems that tend to accumulate in memory. It is a simple thing to try, though. This is always a good idea if you are running into problems – as long as you are careful. QuickBooks provides free updates during the life of the product (about three years), which can either be installed automatically or at a time of your choosing. BE CAREFUL with this in a multi-user situation – as all users should be (and sometimes must be) on the same release. If you update your computer to a newer release you may force other users to update, and that can be a bit chaotic if you try this at a busy time. In my sample system, the program was already updated to the R9 release (the latest available at this time), so I didn’t try this step. When you install QuickBooks it places a small batch file in your Program Files folder named Reboot.bat. 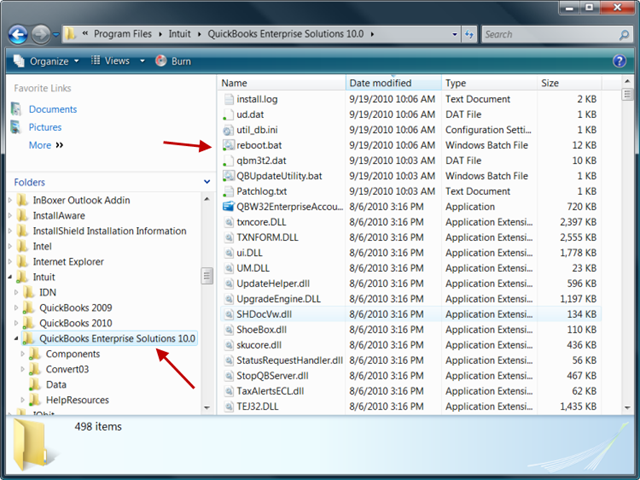 Each version/installation of QuickBooks will have it’s own copy of this file. This file contains a number of command line programs that will go through and reset the Windows registry settings for all of the components that QuickBooks uses. 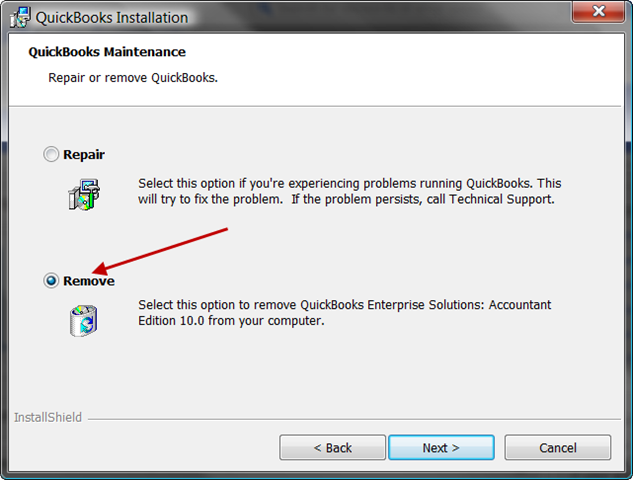 Normally this is taken care of by the installation program when you install QuickBooks. However, sometimes Windows will lose or forget some of these registry settings. Reboot.bat makes sure that everything is “registered” correctly. This is usually a fairly benign procedure – you aren’t changing releases, you aren’t uninstalling things. You are just making sure that the components of QuickBooks are registered properly with your operating system. Before you run this make sure that all copies of QuickBooks on this computer are not running. If this computer happens to be the host for the database in a multi user environment, you need to have all QuickBooks users exit the program as well. In addition, make sure that you are logged on to Windows as a user that has administrative privileges. To find this file, open Windows Explorer and find the folder for your product in Program Files. 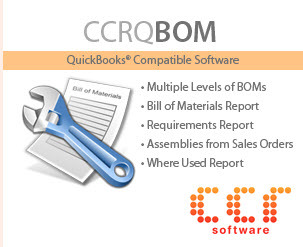 Note that if you have multiple QuickBooks products installed you must use the folder that matches the product that has the problem. Find reboot.bat, double click on it to run it. I will usually restart the computer after running this, although Intuit doesn’t state that this is required. Unfortunately, in most cases, this step did not resolve the problem. I do recommend that you try it, however, as it doesn’t take much time. This seems to be the best way to resolve a number of problems lately, as I’ve mentioned in other blog articles. If the steps I have outlined above don’t resolve the problem, uninstall and then reinstall QuickBooks. 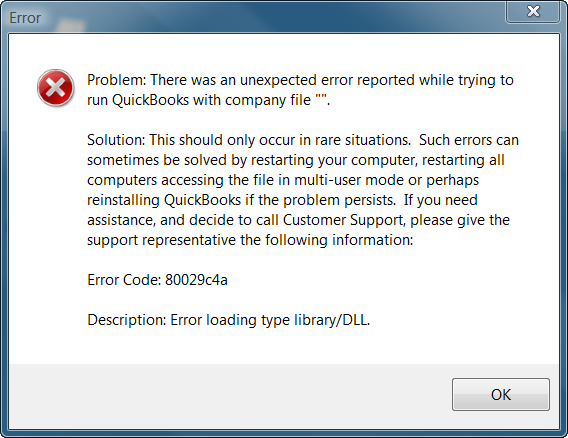 As I mentioned above with updating your release of QuickBooks, BE CAREFUL with this in a multi-user situation. This may be updating the release level of your installation. All users should be (and sometimes must be) on the same release. If you update your computer to a newer release you may force other users to update, and that can be a bit chaotic if you try this at a busy time. If you have a multi user installation go to a different workstation where hopefully you can run QuickBooks without getting this error. On that computer press F2 and look for your License Number and Product Number. Write those down. YOU SHOULD already have that on the original CD if you installed from that, but many people don’t have this information available. IN ADDITION, look at the Product line to see what Release you are running. Go to your Windows control panel, find the Programs section, locate your copy of QuickBooks, and select uninstall. 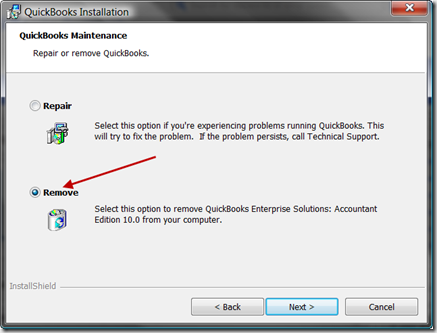 In the QuickBooks installation program select remove – do not select repair. If you select Repair then most likely you will get an error during installation, such as a 1334 error. The next step is very important in multi user installations. Go to the QuickBooks product update web site and determine what the current release is for your product. Compare this to the release information that you noted when you pressed F2 above. If the other workstations are using an older version then note that you may have to perform a minor file conversion. Normally this isn’t an issue, but to do it you will have to make all users stop using QuickBooks, and they will all have to update their program to the current revision. You may want to find an appropriate time to do this (don’t do it right as someone is about to print payroll checks, for example). Next, reinstall QuickBooks. 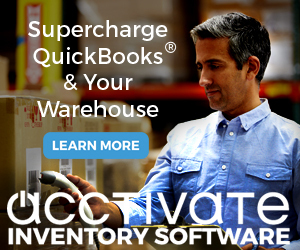 Do not just use your QuickBooks CD for this step. Instead, go to the Intuit QuickBooks Support Download Site and locate your version of QuickBooks in the listing. Download the program. This is a full copy of the program including the latest patches, so you don’t have to apply any patches after installation. Download this, run it, and reinstall your copy of QuickBooks. This has resolved the problem in all of the installations that I’ve worked with, hope it works for you! I’m having problems discounting the paypal payments on QB. Do you have any ideas on that? Herron, that really doesn’t have anything to do with this blog article. “discounting” – do you mean the merchant fee, or something else? Hi Charlie, You the lifesaver as usual. Don’t have anything near an Enterprise edition but read through the blog anyway. Learnt something! That is reinstalling from the website to avoid having to update patches later. Thanks. But looks like am going to annoy you a little by commenting on some unrelated matter (and which you had talked about before!). That’s this problem of having to shell out an additional $4 for upgrading! Just can’t seem to understand it. Is that to pay Intuit for doing what? Anyway, I need to move up from my Pro 2009 to Premier 2011 using your site. Do I get any discount at all or even pay Intuit more than $4 for the privilege? Soga, I’m no writing just about Enterprise – a lot of what I write about applies to Pro and Premier too. Upgrading from one “year” of product to another is their business model, I won’t defend it. I’m not sure about the “$4” – that would be a great upgrade price! 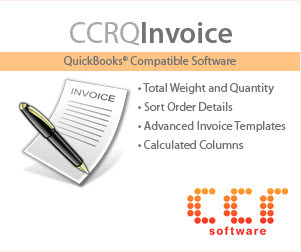 See https://qbblog.ccrsoftware.info/2010/09/quickbooks-2011-pricing/ for an article about pricing and getting the best price. 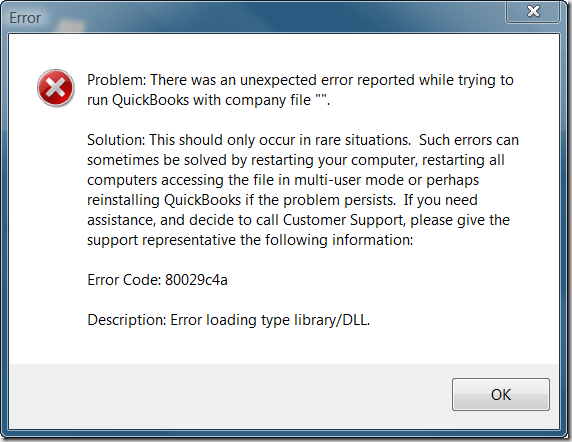 Fixing Quickbooks error 80029c4e – – – I tried all of the above and still get the same message. Any other suggestions? Are you sure it is 80029c4e? an “e” on the end? I’ve never seen that error, have no idea what that is. Doesn’t show in any QB documentation of internal errors. quickbooks error 80029c4a is very easy to fix. you should definitely use quickbooks file doctor tool to diagnose the problem with your company file. Where do I find the file doctor tool mentioned? It was released after this article was first published. Note, though, that File Doctor does not always resolve this particular error. I had this error and called support and they were going to charge me $499 just to fix it long enough for me to get in and do payroll and then I would have to send a thumb drive back up to intuit data recovery for another $899 and be without any access for 7-10 days!! Crazy!! I followed these steps of uninstalling and reinstalling and everything is back up and working perfectly!! Don’t fall for the scam!!! Like Nichole I had same experience with intuit. Third party company doing ‘service’. Finally asked for supervisor and ranted a bit and it was fixed. I think he reloaded it. I was not going to pay for another program that was’nt even a year old. Very frustrating and feel like this was another planned obsolescence in their product. Too bad there isn’t a good alternative.. Doing reboot.bat will not lose my data on QB? No, it is perfectly safe. It just resets registry keys and things of that sort. You QB data is stored in a file with a file type of QBW. You should be making backups of that file periodically. And, uninstalling QB (etc.) doesn’t remove that file. Thanks Charlie. I was facing this error in my Enterprise 17.0 version and by following these steps i am able to fix this error by own. Now i can say this that Error 80029c4a is very easy to fix by using QB File Doctor tool.